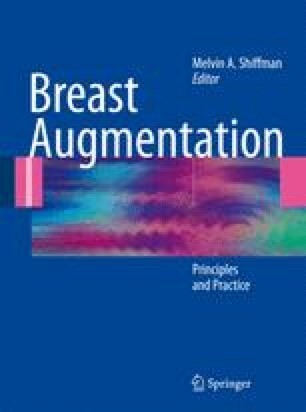 Breast augmentation via a subglandular approach is, at least in theory, an anatomically correct approach; that is, we seek augmentation of the breasts and not the pectoral muscles. The ideal breast has a teardrop shape, a well-defined inframammary fold, good volume, and adequate projection. With subpectoral augmentation, the breast assumes a hemispherical shape, especially when viewed laterally, due to pectoral muscle cover and compression of the implant by it. This fullness of the superior pole is also contributed to by contraction of the muscle, which has a tendency to push the implant upward. The inframammary approach also gives better control over the inframammary fold, which may need to be lowered with inferior quadrant hypomastia. It also permits complete visualization of the pocket, enabling an easier dissection. The scar can fashioned such that it is hidden by the lower pole of the augmented breast.